We read with great interest the article by Talih et al. in a recent issue of the journal . The authors performed a cross-sectional study to evaluate the prevalence of burnout, depressive symptoms, anxiety symptoms, and attitudes toward substance use in medical students. 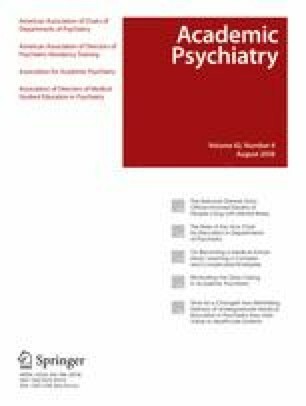 They detected high rates of depression, burnout, and suicidal ideation among medical students in the Middle East. The authors should be congratulated for performing a well-designed study in an important topic in graduate medical education and overall physician practice [2, 3]. Additionally, the need to identify specific areas for potential interventions to prevent burnout in medical students is an innovative concept that needs to be further explored [4, 5]. Although the study by Talih et al. was well designed and well conducted, there are some questions regarding it that need to be clarified in order to determine the validity of the results. First, the analysis of burnout across medical school years would need to be adjusted for confounding factors. This would validate the authors’ important findings. Second, the authors reported a 42% response rate for the survey. The potential for generalization of the results relies on excluding response bias by contrasting the characteristics of nonrespondents with respondents of the survey. Lastly, the authors did not present common factors associated with burnout (e.g., working hours and control over personal life), and these factors can significantly change the study results. We would welcome comments to address these issues as they were not discussed by the authors. This would help to further validate the findings of this important study. On behalf of both authors, the corresponding author states that there is no conflict of interest. Talih F, Daher M, Daou D, Ajaltouni J. Examining burnout, depression, and attitudes regarding drug use among Lebanese medical students during the 4 years of medical school. Acad Psychiatry. 2018; https://doi.org/10.1007/s40596-017-0879-x.